Honda arbeitet an einem neuen Automatikgetriebe, welches erstmals in der DN-01 eingesetzt wird. Eine Mischung zwischen Motorrad und Roller. 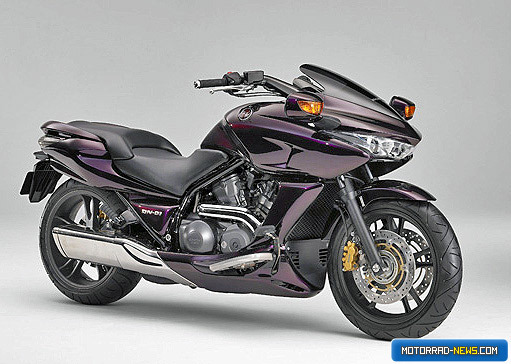 TOKYO, Japan, October 4, 2007–Honda Motor Co., Ltd. announced that it has developed the Human-Friendly Transmission (HFT), a new automatic transmission system for motorcycles using Honda’s own infinitely variable hydraulic mechanical transmission. Easy to operate, the HFT realizes outstanding relaxed riding comfort, riding feel with direct response and excellent transmission efficiency. The HFT will be installed on the DN-01, a new motorcycle scheduled for market launch to be introduced at the 40th Tokyo Motor Show. With Honda’s own infinitely variable hydraulic mechanical transmission, this HFT realizes the lightweight and compact configuration required for motorcycles. To meet the wide range of rider needs, HFT offers a selection from two fully automatic shifting modes—D mode for ordinary riding and S mode for a sporty riding experience—or the 6-speed manual mode, which gives riders the option of riding with a manual transmission feel. The HFT creates a unique riding feel through easy operation, ranging from relaxed and laid-back riding to nimble and sporty with direct throttle response. Die Hauptvorteile liegen dabei eindeutig in der gesparten Schaltarbeit und dem damit gestiegenen Reisekomfort. Dabei kann entweder der vollautomatische Modus gewählt werden, oder zwischen 6-Schaltstufen gewechselt werden. Laut Honda handelt es sich um ein unendlich variables System. Die Hauptkonfiguration besteht aus einer Ölpumpe, welche die Motorleistung in hydraulischen Druck umwandelt.